Adjustable seal which is ideal when forming a tight seal at a ceiling or floor. Zipwall foamrail span is an adjustable seal which is ideal when forming a tight seal at a ceiling or floor. 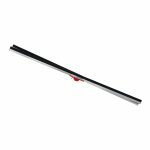 This product easily slides to expand or contract from 4'3" to 8' of barrier edge just using one pole.